The region was named after a photograph taken by the Hubble Space Telescope on April 1, 1995. The stars formed in this region have surface temperatures exceeding 30,000 degrees Celsius while they are on the main sequence. In comparison, the Sun’s temperature is only about 5,500 degrees. The young stars in M16 are a source of strong stellar wind and intense ultraviolet light that shapes and gradually erodes the gas and dust structures in the region. 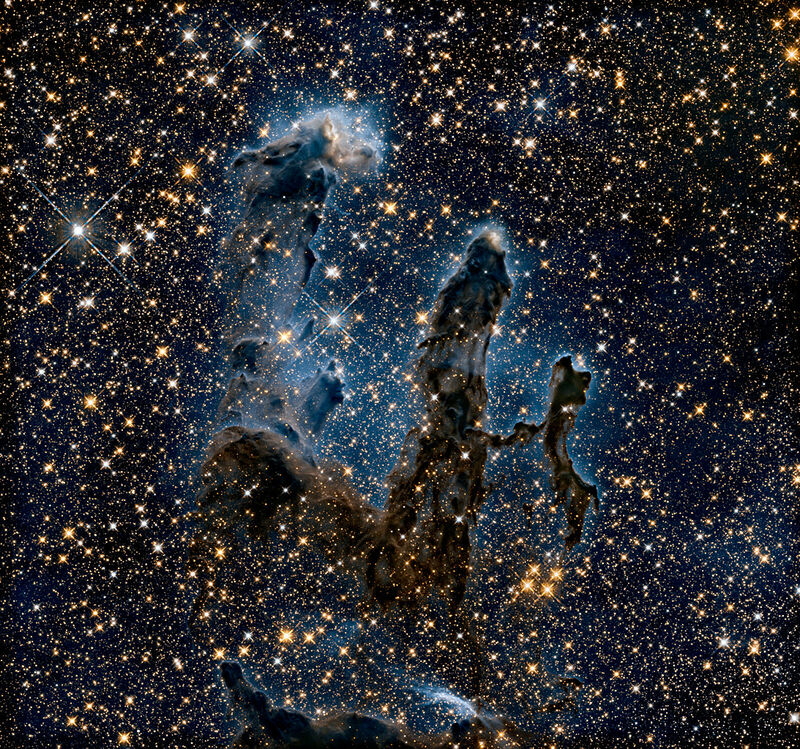 The Hubble image by Jeff Hester and Paul Scowen, astronomers at Arizona State University at the time, was so named because the pillars of gas were in the process of creating new stars. At the same time, the pillars were also being destroyed by the intense ultraviolet radiation from the nearby newly formed stars. NASA’s Hubble Space Telescope has revisited the famous Pillars of Creation, revealing a sharper and wider view of the structures in this visible-light image. Astronomers combined several Hubble exposures to assemble the wider view. 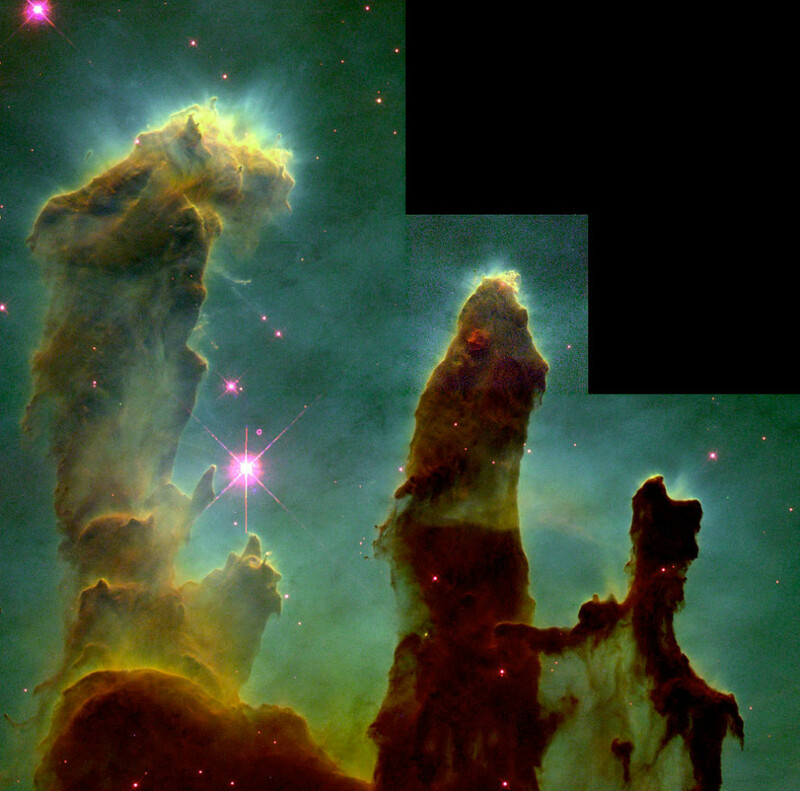 The towering pillars are about 5 light-years tall. The dark, finger-like feature at bottom right may be a smaller version of the giant pillars. The new image was taken with Hubble’s versatile and sharp-eyed Wide Field Camera 3. The Pillars of Creation are composed of dust and cool molecular hydrogen. The tallest pillar, to the left of the image, is roughly 4 light years high, while the protrusions seen at the top of the clouds that form the pillars are larger in size than the entire solar system. The gas behind the protrusions is shielded from the ultraviolet radiation of the young stars by evaporating gaseous globules (EGGs), regions of hydrogen gas that were first conclusively identified in Hubble images in 1995. The gas and dust inside the EGGs are denser than those outside and eventually begin to form protostars, making EGGs incubators of new stars. A near-infrared survey using the Very Large Telescope’s (VLT) 8.2m-diameter ANTU telescope and the ISAAC (Infrared Spectrometry and Array Camera) instrument has revealed that 11 of the 73 EGGs possibly contained young, low-mass stars and that the tips of the three pillars also had young stars and nebulosity not revealed by the Hubble image. The Pillars of Creation were likely destroyed in a supernova explosion some 6,000 years ago. Photographs taken with the Spitzer Space Telescope have revealed a cloud of hot dust near the pillars that could have been a shock wave created by the supernova, and if this were the case, the pillars would have been directly in the shock wave’s path. As the pillars are located at a distance of 7,000 light years from Earth, the destruction – if it had indeed occurred – will not be visible from Earth for another 1,000 years. However, there are scientists who believe that the supernova event may not have occurred at all, as the radio and X-ray radiation should have been more intense than those observed. Without the supernova event, the pillars will be eroded more gradually, over a longer period of time. These eerie, dark pillar-like structures are columns of cool interstellar hydrogen gas and dust that are also incubators for new stars. They are part of the “Eagle Nebula” (also called M16 — the 16th object in Charles Messier’s 18th century catalog of “fuzzy” objects that aren’t comets), a star-forming region 7,000 light-years away in the constellation Serpens. Ultraviolet light is responsible for illuminating the convoluted surfaces of the columns and the ghostly streamers of gas boiling away from their surfaces, producing the dramatic visual effects that highlight the three dimensional nature of the clouds. The Herschel Space Observatory photographed the Pillars of Creation in far-infrared wavelengths in 2011. The image provided astronomers with a better insight into the structures, processes and forces at play inside the region of the Eagle Nebula. The X-ray images of the Pillars of Creation from the Chandra X-ray Observatory have revealed that any newly formed stars embedded with the EGGs are not hot enough yet to emit X-rays as all X-ray sources were found randomly scattered around the area, not coinciding with the pillars. A new look at the famous “Pillars of Creation” with NASA’s Chandra X-ray Observatory has allowed astronomers to peer inside the dark columns of gas and dust. This penetrating view of the central region of the Eagle Nebula reveals how much star formation is happening inside these iconic structures.The Chandra data shows bright X-ray sources in this field, most of which are young stars. In this image, red, green, and blue represent low, medium, and high energy X-rays. The Chandra data have been overlaid on the Hubble Space Telescope image to show the context of these X-ray data. Very few X-ray sources are found in the pillars themselves. This suggests that the Eagle Nebula may be past its star-forming prime, since young stars are usually bright X-ray sources. However, there are two X-ray objects found near the tips of the pillars. One is a young star about 4 or 5 times as massive as the Sun, visible as the blue source near the tip of the pillar on the left. The other is a lower mass star near the top of the other pillar that is so faint it is not visible in the composite image. The Chandra observations did not detect X-rays from any of the so-called evaporating gaseous globules, or EGGs. The EGGs are dense, compact pockets of interstellar gas where stars are believed to be forming. The lack of X-rays from these objects may mean that most of the EGGs do not contain enshrouded stars. However, infrared observations have shown that 11 of the 73 EGGs contain infant stellar objects and 4 of these are massive enough to form a star. The stars embedded in these 4 EGGs might be so young that they have not generated X-rays yet and one of them (E42) – estimated to have about the mass of the Sun – could represent one of the earliest stages of evolution of our nearest star. The Sun was likely born in a region like the Pillars of Creation. The pillars and the few stars forming inside them are the last vestiges of star formation in the Eagle Nebula, also known as M16, which peaked several million years earlier. This contrasts strongly with the active star forming regions in other clusters such as NGC 2024, where Chandra sees a dense cluster of embedded young stars. The results were published in the January 1st issue of The Astrophysical Journal and the research team, led by Jeffrey Linsky of the University of Colorado, includes Marc Gagne and Anna Mytyk (West Chester University), Mark McCaughrean (University of Exeter) and Morten Andersen (University of Arizona). Image – X-ray: NASA/CXC/U.Colorado/Linsky et al. ; Optical: NASA/ESA/STScI/ASU/J.Hester & P.Scowen. 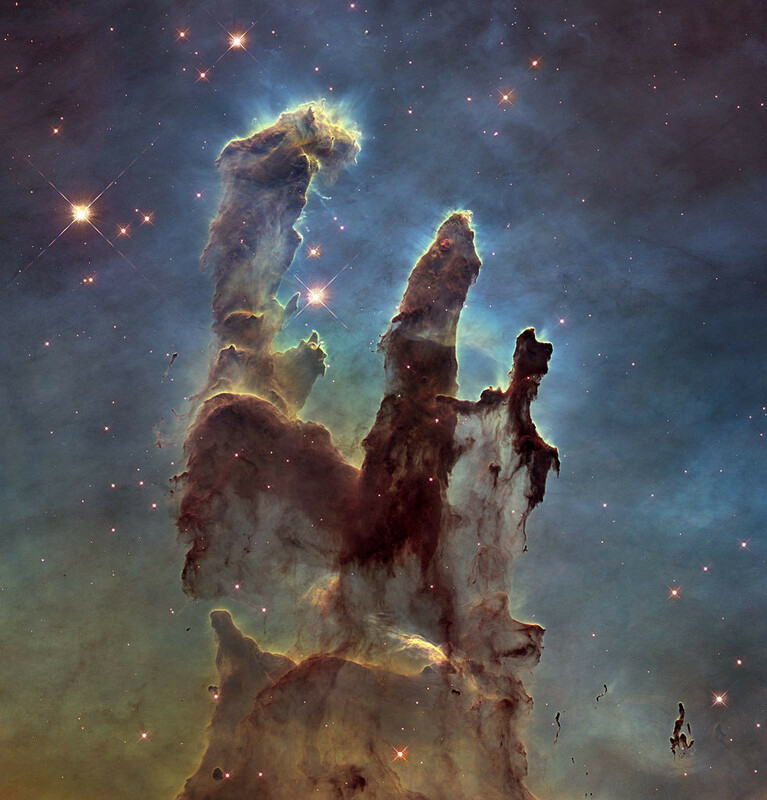 A new image of the pillars, taken by Hubble, was unveiled at the American Astronomical Society meeting in Seattle in January 2015 in celebration of Hubble’s 25th anniversary on April 24, 2015. 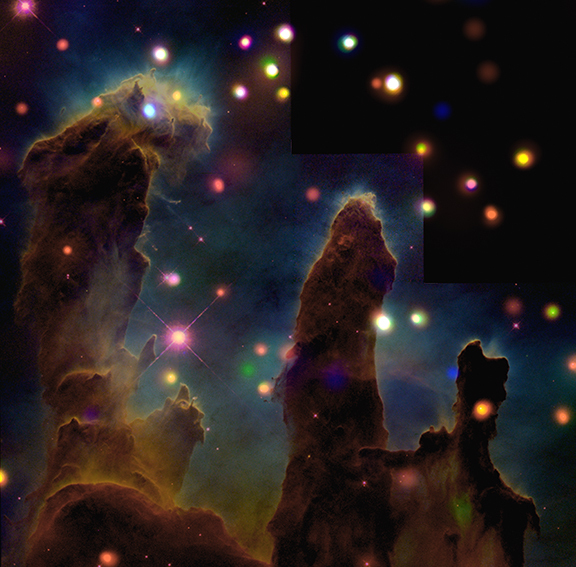 The pillars were photographed with Hubble’s Wide Field Camera 3 and the image was created using visible light and near-infrared exposure.